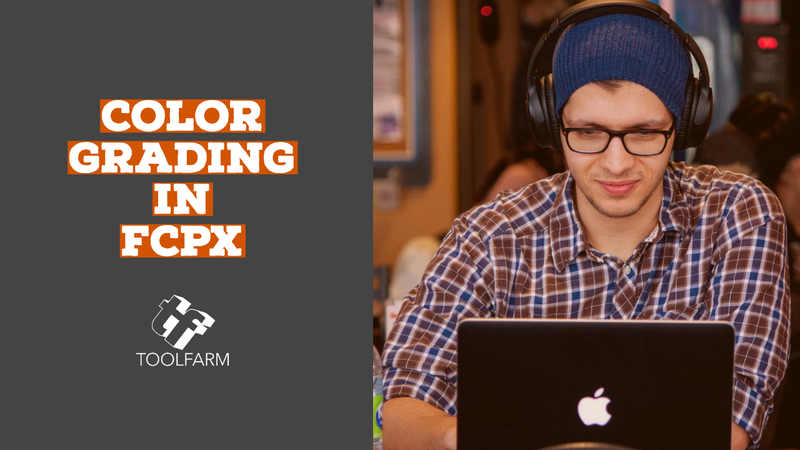 One topic we haven’t covered much is Color Grading in FCPX, so it’s time to remedy that. FCPX 10.4 came with some hot new features for color grading, including the Color Inspector and Color Wheels, making color grading easier and more intuitive. Mark Spencer and Steve Martin from Ripple Training give a nice overview of the tools for Color Grading in FCPX. Mark Spencer and Steve Martin talk about the new hue sampler in Final Cut Pro 10.4, specifically color masking vs. hue sampling. It’s very powerful. KingTutsPro gives you some tips on working with the scopes and color wheels in Color Grading in Final Cut Pro X.
Nick Harauz walks you through the Color Grading in FCPX (10.4). Learn how to use the color board, color inspector, and make adjustments using color wheels. He also talks about hue vs saturation curves, white balancing, custom LUTs and much more. Not too long ago I encouraged you that if you had previously given up on FCP X, now was the time to give it another look. The addition of the color grading features in 10.4 makes it even more exciting. One could argue that, except for on rare occasions, all the primary and secondary color corrections you would previously do in a third-party app, can now all be done in FCP X. The newest version offers flexibility for any creator to work with the color effects they’re most comfortable with. These new features build on a list of others not mentioned in this article like native 360 video support and HDR content delivery. Combine this with its already existing toolset and we just may have a game changer. Prefer to use a third-party for Color Grading in FCPX or LUTs? Toolfarm has a wide variety from companies like Boris FX, NewBlueFX, Coremelt and many more. Shop Now. Professional Color Grade and Toning Filters … and Scopes to Stay Safe! Set the mood with professional color grading tools. Adjust brightness and contrast. Play with hue saturation. Includes 15 filters & 150+ presets. Cross-host license. Our LOG and Linear SpeedLooks have been combined into one affordable package. SpeedLooks are designed by industry professionals for cinematographers, editors and colorists to achieve the character and beauty of 35mm film, all with the click of a button. The Feature Looks LUT collection for LUTx is a set of 40 Feature Film looks designed by experienced film colorist Shane Bartley. These looks are inspired by recent blockbuster and indie film hits from the last 20 years, and range from dramatic stylised looks to subtle manipulations of blacks. New in AutoGrade 3.0 is a simple but powerful new module that gives you an instant one-hit result, as well as a great new way to make great-looking instant corrections by sampling the skin tones in your image. AutoGrade 3 for Final Cut Pro, Premiere Pro, After Effects & Motion. Revolutionary Automatic Color Correction Plugin for Final Cut Pro X, it makes your footage look completely natural, just the way you would expect to see it. Based on Artificial Intelligence and a first of its kind Technology.